Tutyrgan tawyk (a hen, stuffed in Tatar). For stuffing the young hen, fat or average fatness undertakes. Carefully to wash out a hen cold water. To make a cut on a paunch, to remove interiors. Cuts on a carcass to sew up with threads. In front, beginning from a mouth, carefully, separate a skin from carcass meat. For stuffing hen, to take fresh eggs and to let out in separate ware, to add salt, pepper and carefully to mix by a wooden spoon. Then to pour in cream or whole milk and again to mix. If a hen not fat, in eggs possible to add a few butter. The received mix to pour in by a spoon between a skin and meat of a hen. Having stuffed a hen, the aperture (in a skin) needs to be fastened strong by a white thread. That the skin has not burst and the form has remained, the hen should be turned in a napkin or a gauze and to lower in poorly boiling added some salt water. It is necessary to watch closely how the stuffed hen cooks. It is necessary to cook on slow fire 1 — 1,5 hours. When the hen will be swell in a hot broth, a skin in several places pierce a thin needle and let the air out. 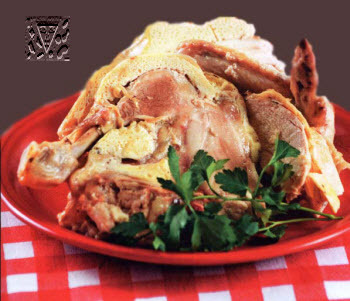 The ready hen is split into 4 parts and serve in a hot kind. It turns out two back legs and two breast which are filled by an omelette. It is possible to put the ready hen in an oven, to give to it will brown. On a table a hen submit with a potato or boiled rice. For stuffing hen 1-1,2 kg: 8-10 eggs, 50 g butter (if a hen not so fat), 150-200 g cream or milk, salt, pepper. Earlier in the Tatar villages for visitors often did zhylgyr — the big pelmeni with a stuffing from hempseed flour. The cleared grains of hemp at first are necessary for drying in an oven, then to shatter in a wooden mortar so that the peel has separated, and grains became mealy. Pounded hemp put in shallow ware and squeeze out fat by hands. In hemp should not remain fat, therefore this process lasts long enough. The received fat separate and filter, and the remained flour and a peel fill in with cold water. After a while the peel and the fat rests will rise upward, and the flour remains below. A peel and the fat rests collect by spoon, and a flour with water pass through a sieve. In 10—15 minutes water pour out, the flour remains at the bottom of ware. It fill in with hot water and put on fire. During boiling time the white flour rises upward, it collect in a colander and carefully filter. Dense, white, boiled hempseed flour turns out, in which add small cut onions, salt and mix to homogeneous weight, and the stuffing for zhylgyr is ready. Then prepares dumpling dough, it is thin unrolled, and from it a glass cut out circles on which in advance prepared stuffing is put by 40—50 g. Edges of dough are pinched as at samosa. 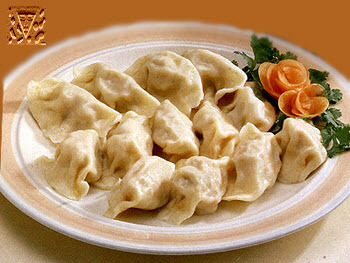 The pelmeni made thus cook in the added some salt water, in a broth or in milk. Zhylgyr eat hot. To it submit with hempseed oil, katyk or sour cream. For one portion: 300 g dough for pilman, 400 g stuffings, 1 onions, 1 litre of milk, the rest to taste. Steak tartare is usually associated with both Parisian bistros and the Tartars who gave the dish its name. 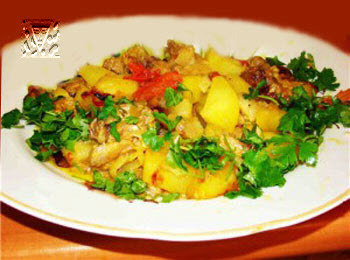 However, modern Tatar cuisine has very little the general with this dish. Trim and grind the meat twice. Chop finely the onions and egg yolk. In a bowl, mix the egg yolk, onions, capers, mustard, Worcestershire sauce, Tabasco sauce, salt and pepper. Add olive oil and beat lightly for a few seconds. Add meat and parsley. Season with salt and pepper. Beat lightly for a few seconds. Refrigerate or serve immediately. It is very important that you only use the freshest fillet of beef for this dish. At first prepare grain kvass. Then a boiled egg yolk pound with ready mustard and granulated sugar. Add this mix in kvass and well having mixed, put for some time in a cold place. Small chop green onions and rub with salt. Boiled cold meat, a fresh cucumber and boiled egg cut long strips (by noodles). All products put in cold kvass and well having mixed, having added salts put for 30 minutes in a cold place. Pour ready okroshka in the portions and having strewed small cut fennel submit to a table. Separately to okroshka submit katyk or sour cream. To cold soups at will it is possible to submit food ice. 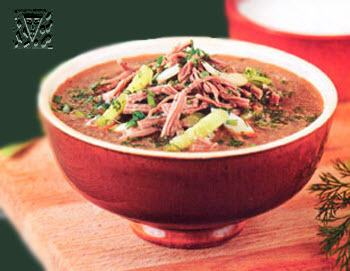 For one portion: 300-350 g kvass, 80-100 g boiled meat, 50 g green onions, 50 g fresh cucumbers, 1 egg, 100 g katyk, salt, granulated sugar and the rest to taste.